In 2015, the moon will be full on December 25. There are messages going around via social media talking about a Christmas full moon being a rare thing, so everyone should take note and enjoy. Just how rare is a full moon on Christmas? Of course, to properly answer the question, we have to do some research. And we have to establish a few definitions. Let’s cover a 200-year period from 1851 to 2050. That should give us plenty of years for a fair statistic. Astronomers say the moon is full when it’s most opposite the sun. We can calculate that down to the minute. Now we need to decide which time zone to use for our purpose. The December 25 full moon in 2015 happens at 11:11 Universal Time. That’s almost the middle of the day in the centrally located Universal time zone. Nearly the entire world will consider it to be December 25 at that moment. On Midway Island in the Pacific Ocean, Christmas Day will have just begun. It’ll be 12:11AM. A quarter of the world eastward from there, the sun will be rising on Christmas morning in the Americas. Another quarter of the world eastward, and it’s midday in Africa and Europe. Keep going east and that full moon is happening at 11:11PM on Wake Island in the Pacific Ocean on the opposite side of the International Date Line as Midway. Perhaps you’ll find it amusing that this otherwise Christmas Day full moon is not happening on December 25 on Kiribati—also known as Christmas Island. It’ll be December 26 already there at 2:11AM. Well, anyway, the point to remember is that when the moon reaches full phase on a given date, it may be another date in another part of the world. To keep it simple, let’s use Universal Time. There are six December 25 full moons in the selected 200-year period: 1863, 1901, 1920, 1977, 2015, and 2034. On average, it happens every 33 years. But the last one happened 38 years ago and the next one will happen in just 19 years. But we’d better consider another way of looking at it. Nearly everybody who looks at the moon the day before it’s full will consider it to look full already. Likewise, nearly everyone who looks at it the day after it’s full will consider the moon to still look full. So we need to add December 24 and December 26 full moons to the list. 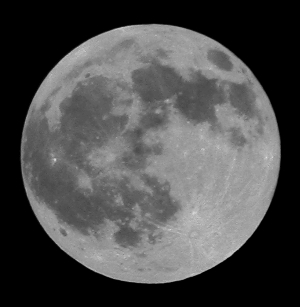 December 24 full moons in our survey period occur in: 1882, 1912, 1931, 1950, 1996, 2007, 2026, and 2045. There are eight of those. There are also eight on December 26: 1871, 1890, 1909, 1928, 1939, 1958, 2004, and 2042. That brings us to 22 moons that people would say are full on Christmas during a two-century span. That’s once every nine years on average. It’s not looking like such a rare phenomenon anymore. But don’t let the analysis spoil it altogether! It’s been eight years since the moon has looked so full on Christmas, and after this year it’ll be 11 years before it looks so full on Christmas again! So if full moons and Christmas are special to you, make the most of it.